Having had a really sad week after my beautiful Roz (veiled) disappeared from her sun spot in the garden, I am now looking forward to a new arrival in the form of a little panther male. 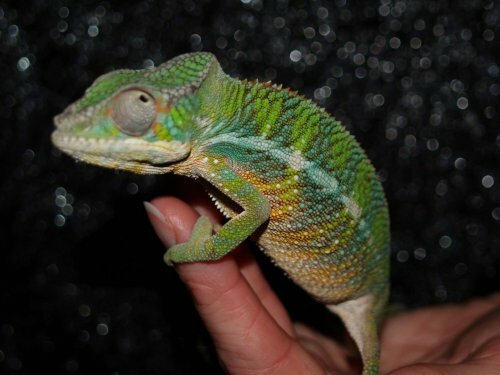 I’ve been following a UK breeder called Krayzee Chamz for nearly 2 years now and they will be sending him to me via DEFRA courier in a couple of weeks. It’s real mix of emotions but I am beyond excited. The two pics below are of his sire and the little guy himself. After the support and kindness of this forum, I thought I’d share some of my happy news. 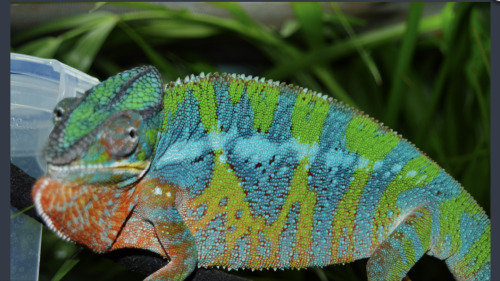 I would keep looking for your other cham at night in your yard with a flash light. They practically glow in the dark. I've heard a lot of people lose their chams this way. I recommend they only ever be outside inside a screen cage. You probably know that now. Best of luck with that panther cutie. I’m sorry you lost Roz. Maybe he will still turn up. Congrats on your new panther. Roy is an excellen breeder and awesome human being. Keep looking! You may be surprised. If she’s alive, I doubt she’s suffering. Veileds are extremely temperature tolerant and aggressive eaters. As long as it’s not freezing at night, she may be doing very well. Best of luck with your new chameleon, and I hope she turns up. Awesome addition. Do you know of any other breeders or importers in the UK? I live in South Africa and I'm moving to the UK this year. I'm definitely going to breed Chams that side. There are a few. The Chameleons UK Facebook Group is a good place to start, there's a few breeders on there.